Wild Thing, by author and physician Josh Bazell, is a sequel to his thrilling debut Beat The Reaper, which introduced former mob hitman Pietro Brwna as he tried to make up for his crimes by working as a doctor. Beat The Reaper was essentially Brwna’s origin story, and spent much of its time flashing back over his life up to that point. It was simultaneously an intensely personal story and a breakneck thriller full of black-as-night gallows humor. For example, in one particularly nerve-wracking scene, Brwna uses one of his own bones as a weapon. As soon as I finished reading it, I wanted more, but I also couldn’t quite picture where the story might go next. Beat The Reaper would be a hard act to follow for any author, and I’m glad that Bazell took up the challenge even if I don’t think the results quite hit the mark. We catch up with Brwna on a cruise ship three years after the events of the first book. Now he is going by the name Lionel Azimuth and pulling rotting teeth for crew members as part of his catchall position as ship’s doctor. Brwna hates life on the boat, so when his old mentor hooks him up with a job working for a reclusive billionaire (referred to only as Rec Bill), he jumps at the chance. At least, he does until he finds out that the job involves going to Minnesota and hunting for a mythological lake monster as part of what may or may not be a scam or criminal operation. Softening the blow is the fact that his companion for the trip will be Violet Hearst, a paleontologist who is both a knockout beauty and a firm believer in the inevitable apocalypse due to ecological catastrophes. Much to Brwna’s surprise, Rec Bill is willing to pony up a steep payment for his cooperation in the trip, and soon enough he gives in despite his misgivings and Violet are on their way. A lot of Wild Thing’s reviews focus on the fact that the subject matter is so different from the first book that it feels strange that it has the same main character. However, I don’t agree with the argument that this doesn’t feel like a Pietro Brwna book; I think Bazell just does as good a job with Brwna’s voice and sense of humor in Wild Thing, and I couldn’t picture any other character taking the lead. I love the character, and definitely laughed out loud more than once. I also don’t necessarily think that the cryptozoological angle doesn’t fit with a story about Brwna, although I could see how hints of possible fantastic elements might raise the hackles of people who like things to stay “realistic”. What I do think is that Bazell actually wrote himself into a corner with Beat The Reaper. How do you write another book about the same character when you’ve a) revealed his entire backstory and b) established that he can’t keep working in a big public hospital? Any kind of follow-up would have to shake things up. I think the real reason people say that Wild Thing doesn’t feel like a Pietro Brwna book is that it isn’t actually about him as a person. Beat The Reaper was entirely focused on Brwna’s fall and redemption. All of the action and tension in the first book originated from events in his life both past and present, which meant that the stakes were exceedingly high and very personal. In Wild Thing, the personal connections are more tenuous, although they are still present to some degree. Brwna has a fear of open water and sharks because the only woman he ever loved was killed in a shark tank, and he also has a fear of intimacy for much the same reason. Naturally, being in close quarters with a beautiful woman as they search for a lake monster means that some of his issues are going to come to the forefront. However, the stakes never feel very high in Wild Thing – either they find the lake monster or they don’t, and Brwna can probably get on with his life either way. Maybe he goes back to the cruise ship, maybe he makes enough money to take care of his problem with mobsters trying to kill him. Compare that to Beat The Reaper, where Brwna is fighting for his life and for personal redemption all while trying to save patient’s lives and barely sleeping, and it just doesn’t sound quite as compelling. However, my biggest problem with Wild Thing is that the plot basically unravels near the end of the book. A lot of time is spent building up to the camping trip and search for the monster, but when it finally gets to that point, everything is over and done with in no time flat, and it feels very anticlimactic. It doesn’t help that the camping trip feels vague and unmotivated once the characters are actually in the middle of the wilderness; after so much time spent discussing the length and dangers of the trip, very little time is spent on the actual trip itself. There are also several characters introduced early on that never end up amounting to anything. A fundamentalist couple arrives at the camping lodge for the trip only to have a one-sided argument about religion with Violet Hearst and storm off-stage, never to return in any meaningful fashion. A Las Vegas magician is mentioned and then subsequently forgotten about until the end of the book, when he is used as an offhand explanation for a plot point. Bazell misses a great opportunity to have these characters interact with each other and Brwna on the trip, and it’s a damn shame. It’s frustrating that the book ends up basically trailing off at the end, because until that point I was definitely enjoying it. I actually liked it more when I first finished it than I did after thinking about it for a few minutes, which is always particularly disappointing. To me it’s a sign of a great writer who perhaps bit off more than he could chew; once I was no longer distracted by his fantastic main character, the holes in the plot were far too easy to see. However, the end of the book very clearly sets up a sequel that could end up bringing the focus back to Brwna’s life; rather than continuing to live in hiding, Brwna decides to go on the offensive and strike back against the mob and his former employer. I’m definitely looking forward to it despite my misgivings about this book. 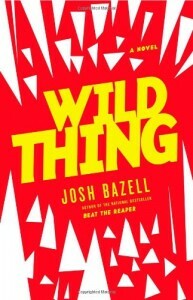 Everything I liked about Wild Thing tells me that Bazell is a great author to watch. The problems I had may just be the symptoms of the dreaded sophomore slump that seems to affect so many great artists.